Article 1st. The meeting house, when built shall be known by the name of the Mount Pleasant Union Meeting House. As the congregations constructed their own churches, the building was put to other uses: notably, it was the site of political conventions during the decades preceding the Civil War. Anti-slavery conventions for Hamilton County were held here, as well as conventions for the Liberty Party in the early 1840s. The locally published newspaper The Philanthropist amply documents these conventions. The Whigs, Democrats and Republicans of the county held conventions here as well, as documented by the Cincinnati newspapers of the antebellum years: Daily Gazette, Enquirer, Philanthropist. 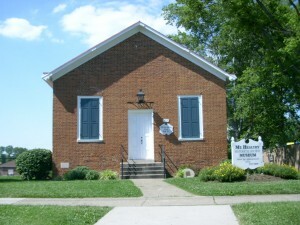 The Meeting House was initially built on a lot on the northeast corner of the intersection of Compton Rd and Perry Street. It was moved in 1966 to the city park on McMakin Street and refurbished . It now serves as the museum for the Mt. Healthy Historical Society.